As soon as you see those words on the big screen, you’re instantly hit with a wave of nostalgia for one of the biggest entertainment franchise in history. Unless you’ve been living in a cave on Tatooine, you know exactly what we’re talking about. It’s here; the biggest day of the year is here! Star Wars: The Force Awakens officially came out today! Not only is it the most anticipated film of the year, it’s already been getting rave reviews from critics. 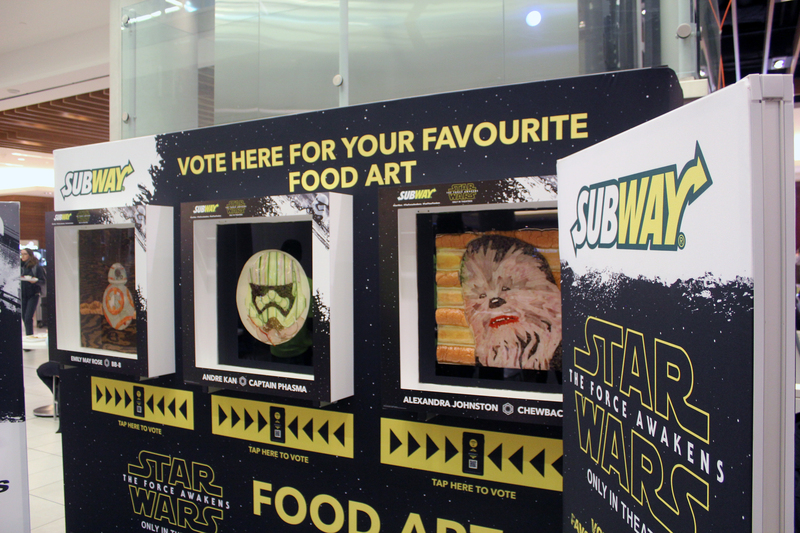 On top of that, Subway Restaurants in partnership with local artists are bringing us Star Wars inspired sandwich art to life to celebrate the release of the crazy-anticipated film. 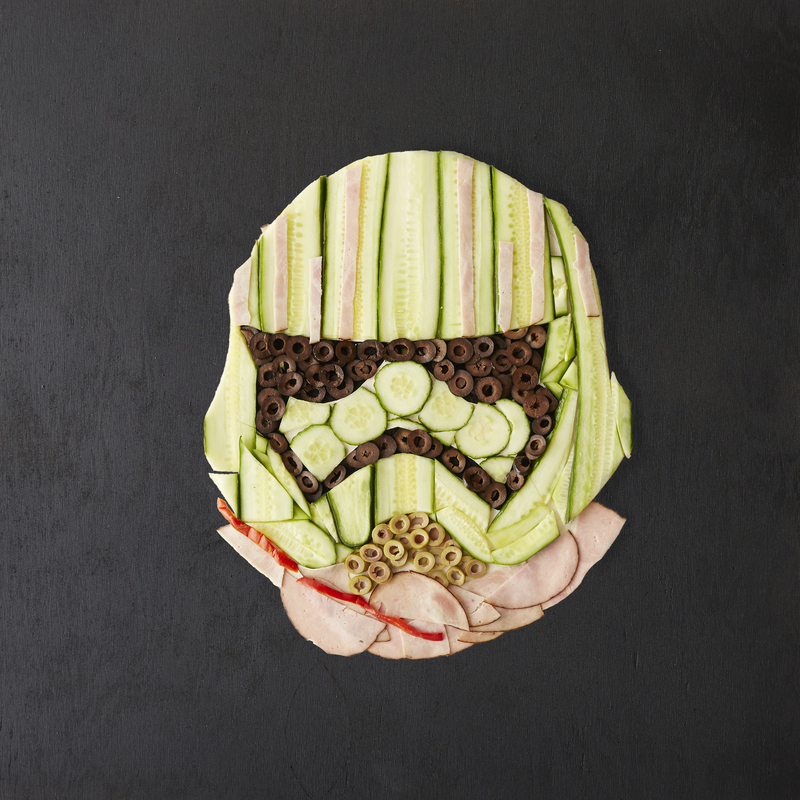 Star Wars and sandwiches, a match made possible by the force. Disclaimer: There will be more Star Warsreferences that you can shake a lightsaber at. At the Eaton’s Center food court, Subway Restaurants in partnership with local artists displayed some pretty amazing artwork using only Subway ingredients. The pieces display were three different characters, done by three very unique artists. 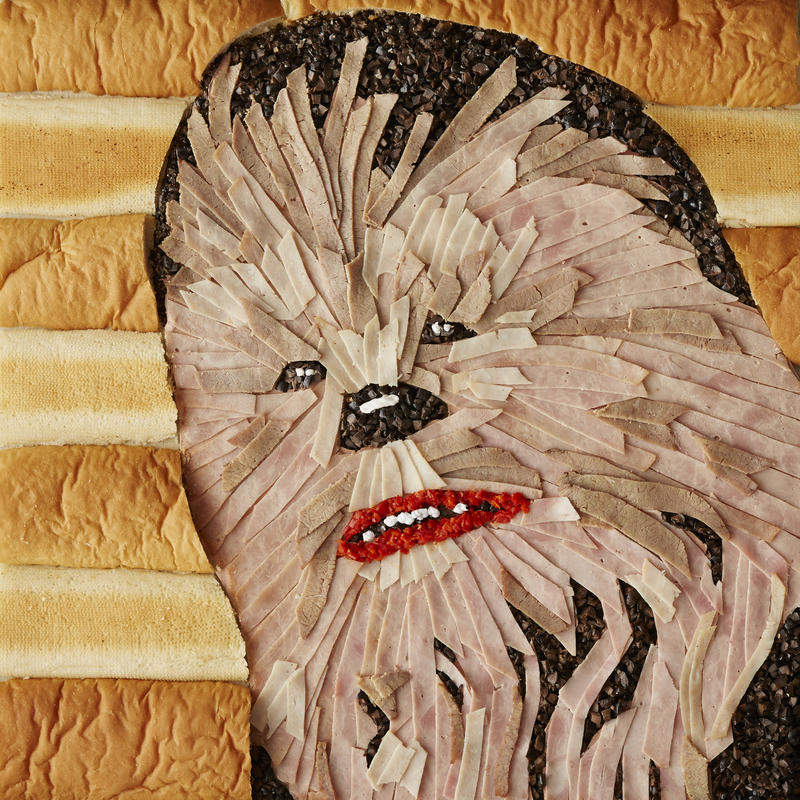 First was Alexandra Johnston who created an amazing Chewbacca using only breads, sliced deli meats like turkey breast and roast beef, and finished it off using black olives and mayonnaise. I asked her about the process behind making her piece, and for her, it definitely wasn’t a regular piece of work. 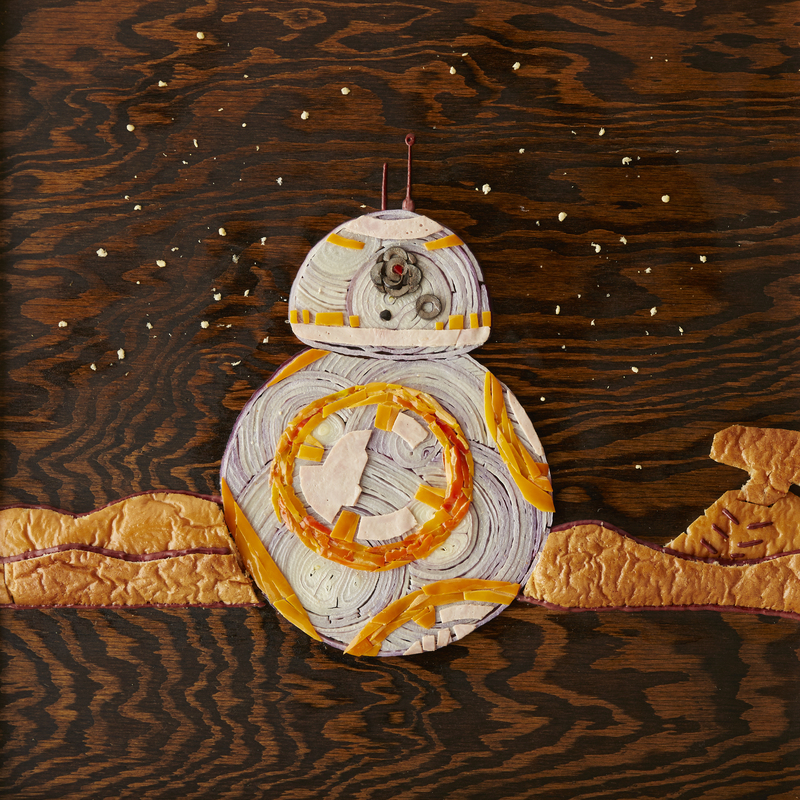 Bringing the new generation of characters into the food art world was Emily May Rose, with her piece on the adorable new droid companion, BB-8. Even with the difficulty behind it, she ended up making an incredibly detailed piece. Yes, she even had a freakin star destroyer in her piece. Even with the challenge behind making such a complex piece, it was worth it since it involved a great character. His piece is made up entirely of sliced up cucumbers in a linear pattern, and ham as it’s main details and olives to wrap it up. All three of these artists created some truly amazing works, but what makes them even better is the passion behind it. For Emily, the movies were the biggest parts of her life, so much that she can’t even pick a favourite movie. On top of being HUGE fan of The Phantom Menace, Andre’s love for the series was strengthened with the great N64 game, Star Wars: Pod Racer. Calling Star Wars an international phenomenon doesn’t even begin to describe the love and passion fans have for the series, a love that is universal for fans new and old. “Most people grew up with it and started watching it as a child. I think it’s the lifelong aspect that most people have with Star Wars, it kinda gets passed down generations.” – Amy May Rose. “The initial movie had a really inspiring connection to the audience, so much that it kinda just stayed with them.” – Andre Kan.
What I saw at the Subway booth, was a trio of artists expressing their love for Star Wars through a very unique medium of art. It’s not everyday that a Wookie made out of bread made me hungry, that’s for sure. If you want to check out the incredible artwork, (and believe me you have to see them to believe it) head on over to the Eaton’s Centre food court where the display will be available till the end of this Saturday. Make sure you vote for your favorite, but I wouldn’t blame you if you had trouble picking just one, all three of them are fantastic. On top of that, your voting could potentially earn you a $500 SUBWAY Cash Card and a print of the winning artwork. That means you get a pretty wicked cool piece of art AND enough Subway sandwiches to last you till Star Wars: Rogue Onehits theatres next year. So much Star Wars goodness over the next few years. Make sure you check out the contest on Facebook, and vote for your favorite artist! To see more from these artists, make sure you follow them on Twitter/Instagram.